Thread lock Compound  - $4.75 : Welcome to Zippkits! 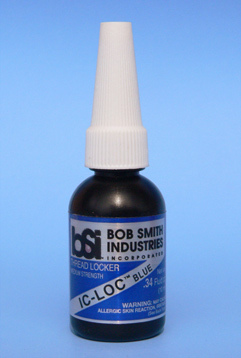 This is the blue "medium" thread locker. Use blue for screws that you want to be able to remove with hand tools, but will not loosen due to vibration. On the gas engines, this works well on the pull starter screws. Use a tiny drop on the threads of the screw then assemble. Full cure in 1 to 3 hours.